Welcome to the Lovely Holiday Blog Hop. 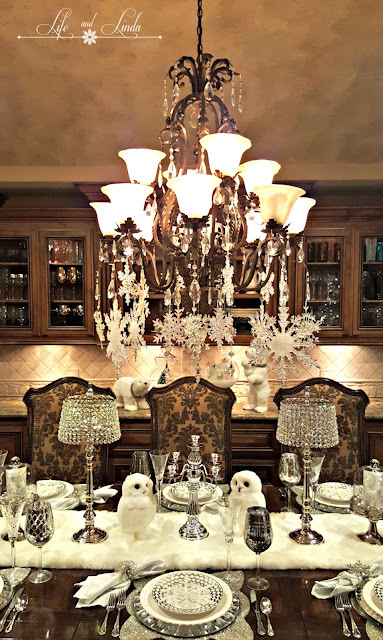 I am joining a fabulous group of bloggers who have set some spectacular Holiday tablescapes. Check out the links at the bottom of this post. I set this table in our formal dining room. This year, I wanted to embrace snowflakes, white and silver. The placemats are silver beaded, topped with jeweled silver chargers . I am using our American Atelier dinner plates with Zgalleries' salad plates. I added sparkly snowflakes to each place setting. The dinner napkins are also silver with a blingy napkin ring. Our dining room is quite large with a full set of cabinets wall to wall. A great place for buffets as well. The other side is a wonderful beverage center. I love dressing our chandelier. I think it makes a big statement. I hung snowflakes from the crystals. The tall candle holders I bought from Zgallerie earlier this year. They fit nicely with the bling look. The silver cloches hold silver and pearl baubles and a silver candle. I added some whimsy with the cute white owls and polar bears. 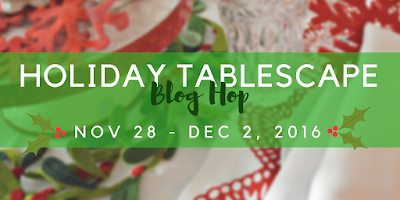 I wish to thank Chloe of Celebrate & Decorate for organizing this Holiday Tablescape Blog Hop! I hope you visit each and everyone of these talented ladies. 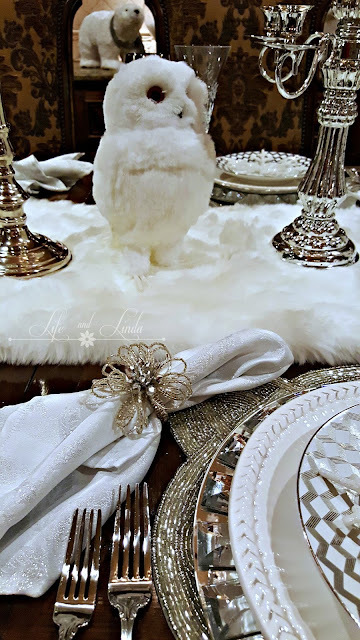 Click on the links below to be delighted with lovely holiday tablescapes. You can find me partying here. Linda, I am bowled over by your gorgeous tablescape. The snowflakes create magic, sparkling above exquisitely layered dishes. The sparkle and shine of silver, the soft, plush white fur, the DARLING white owl (and polar bears), the stunning candle holders. I adore the snowflake favor on each plate--and those plates! The patterns are as intricate as snowflakes. I love it all! Such a joy and treat to play with you today! 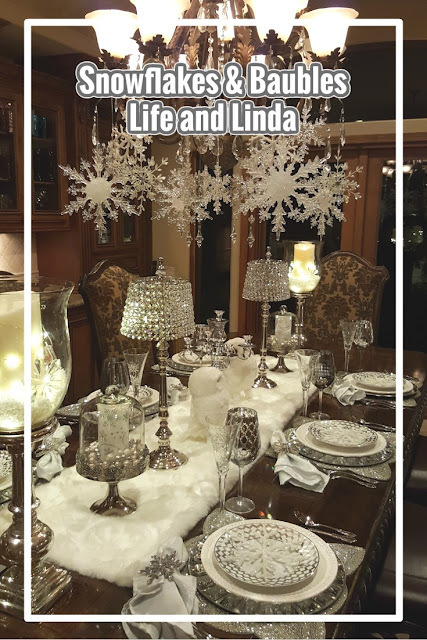 Linda, what a gorgeous setting from the snowflake adorned chandelier to the plate stack. You have definitely created the magic with the glitz and glam. The owl and bears add a perfect amount of whimsy. Guests would find it hard to leave your perfectly appointed setting! Happy Tuesday! Linda, Your dining table is exquisite! Glamour and elegance rule! The beautiful snowflakes hanging from the chandelier caught my eye first and then there was so much beauty to see everywhere. Linda, I love it when I see a dark wood brightened with a table setting like you've done so well! The all-white with wood truly gives the appearance of a woodland scene with snow. The chandelier is breathtaking. Having dinner in a room like this would definitely make me want to dress for the occasion, and that's just one reason why the holidays are so festive. 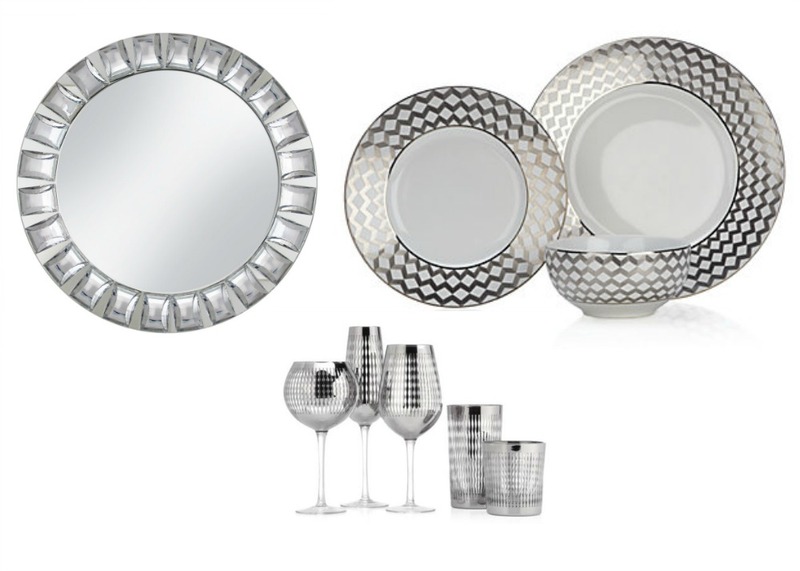 You've done a fine job of taking time as a host to amp up the glam for the season. Happy Holidays. 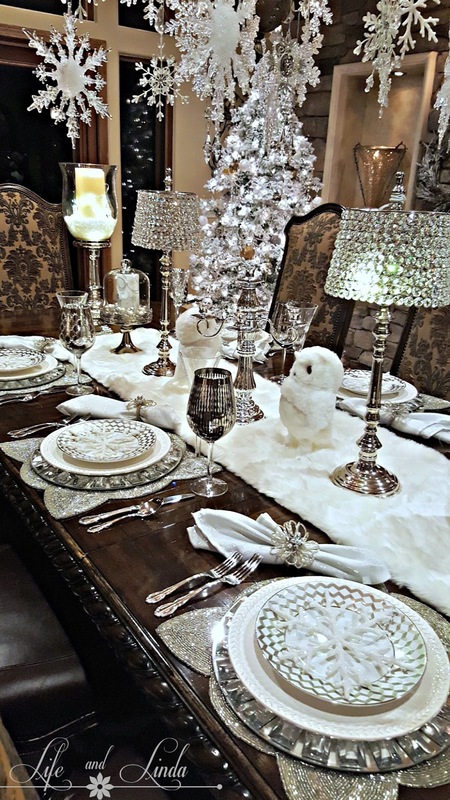 What a dreamy winter table Linda! It is perfect for the holidays and also afterward through the rest of winter. LOVE IT! I just knew this was going to beyond fabulous! Your glorious dining room is perfect for your snowflakes and baubles tablescape. 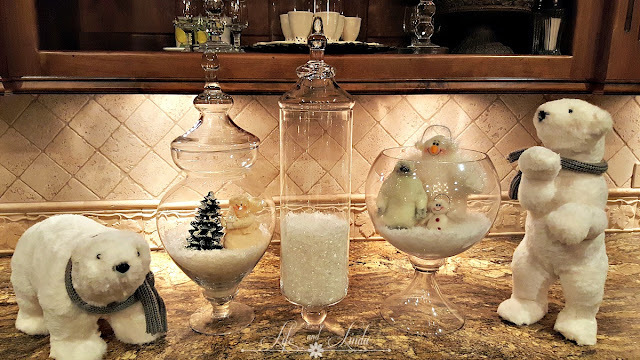 You see I adore Winter themed Christmas vignettes and such because they remind me of the magic of the season. Your chandelier is delightful as are each of the gorgeous details! LOVE! Oh, Linda, what a beautiful tablescape. I really love that this is a table that could be used throughout the winter. This is sparkling and elegant! 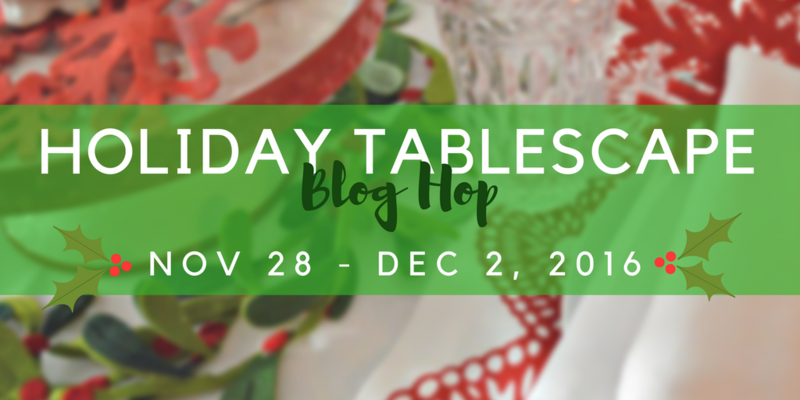 Thank you so much for being a part of the tablescape blog hop! Your table is simply gorgeous! Glorious!! Sumptious!! A true Winter Wonderland!!! I love every inch of this table/room, Linda. Linda, what an elegant tablescape. It makes me want to get dressed up for a party. I love the color scheme ~ very magical and definitely "dreaming of a white christmas" feel. Thank you for sharing on the blog hop. Linda your table is gorgeous! The snowflake theme with all of the glorious sparkle is simply stunning! 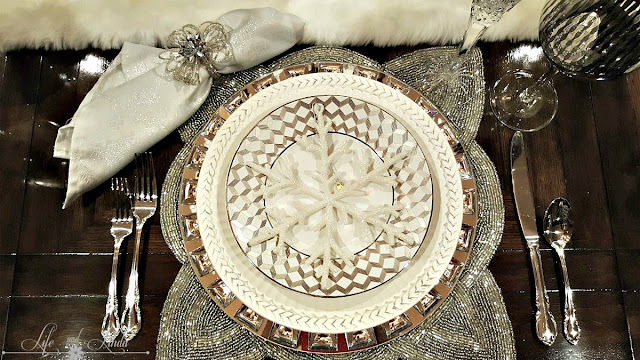 I adore the silver beaded placemats combined with the jeweled charger plates...so pretty! 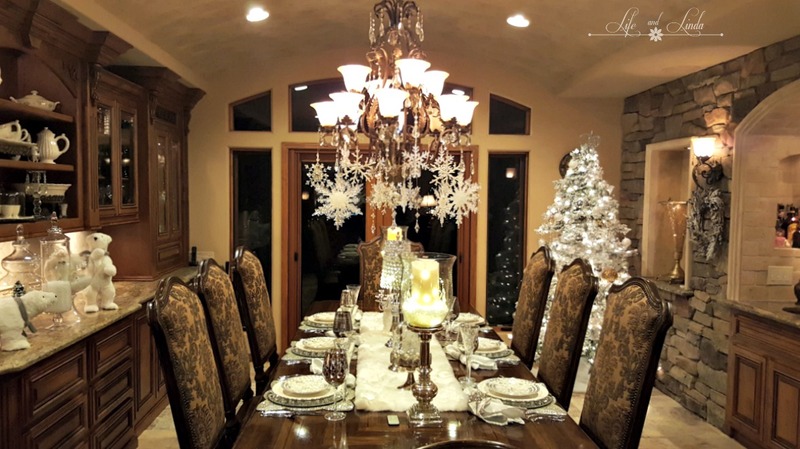 Your dining room is beautiful, and your chandelier adorned with snowflakes is the perfect touch!!! Linda, what a gorgeous table and a beautiful room! I LOVE the snowflakes hanging from the light fixture! It does make a big statement! Well done! Oh Linda it is beautiful. The best part is you can use it all Winter. I love stuff like this. IF I ever get my dining are painted I can start doing tablescapes too. It really is beautiful. Your guests are very lucky. 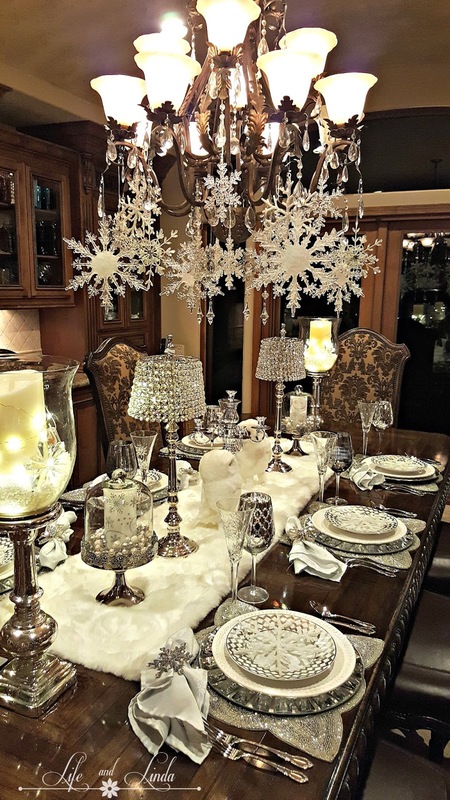 This is so beautiful- love the snowflakes hanging from the chandelier! The dishes are gorgeous and so are the beaded placemats. The polar bears and snowmen additions are perfect! Your dining room is always a joy to see- such a beautiful room! I wish I could have participated but I just couldn't pull it together this early. Have fun with the blog hop! Hello dear Linda! Again, you put on a show-stopping table for ROYALTY! Love the bears! What a magical table Linda. It is a winter wonderland. It is dressed in its finest for sure. I love all the sparkle and the silver and white combination is pure luxury. It is festive and ready for a fabulous dinner party. The little owls are adorable. I also love how you glamed up the chandelier. Your home is gorgeous. I particularly love the wall to wall cabinets. It was a pleasure visiting you today and joining you on this fun tablescape blog hop. Exquisite! I love the snowflakes, where did you find such beautiful quality snowflakes? All the bling is gorgeous! Your tables are always spectacular! This is absolutely gorgeous!! It looks like it's out of a home decor magazine!! Truly, this is my favorite kind of snowscape! I bought a fur tablerunner too, and think it brings such a fun look. The candlesticks are just blingalicious! Everything is so pretty and sparkly, and you know I love sparkles! Oh Linda, I adore your blingy tablescape!! The fur runner is perfect and your chandelier just sparkles with the hanging snowflakes. Your owl, polar bears and all the rest of your snowy decor makes me wish I could be a guest at your pretty table. Linda this is so elegant! I am swooning over this bling it is gorgeous and I hope it never goes out of style. The owls and the polar bears look perfectly at home in this setting as do the snowflakes hanging from your chandy. Love, love, love it all! Merry Christmas! 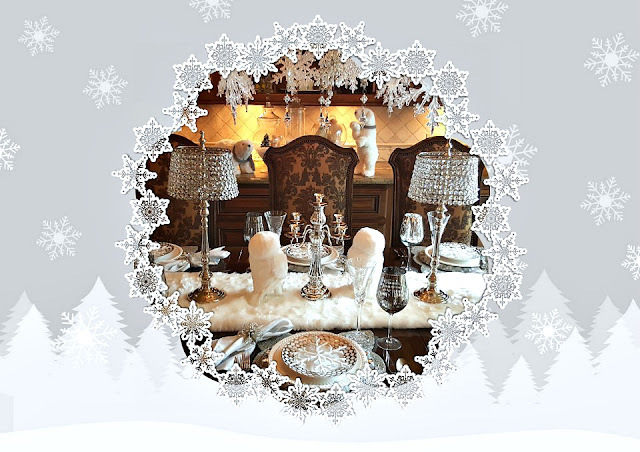 Your snowflake table is gorgeous! You've thought of every detail. 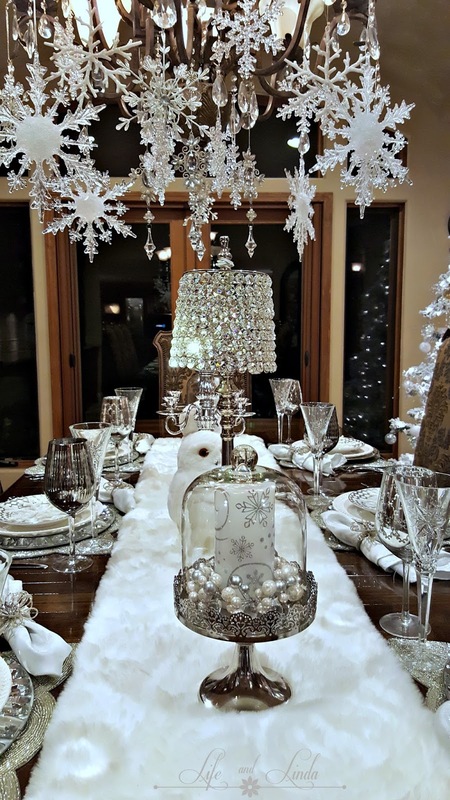 The snowflake idea is wonderful and your table creates a beautiful winter wonderland feel. Those silver chargers are fabulous. The snowflakes from the light are wonderful. Beautiful. Your rock wall is amazing. The sparkles are wonderful and those darling polar bears. I love it all. Thanks for linking to Monday Social. This is a stunner! What a winter wonderland. I love how you really went for the bling. I'm sort of an over the top girl, and I find this design just wonderful. Its like a winter wonderland! Love it! Linda, As always it is just like visiting a castle when I come by to say hello. Actually I read your posts all the time,just don't stop long enough to say hello. Praying you are having a fabulous week; love your style dear friend. Carolyn, I bought them from a local store called Pottery World. where did you find the bauble lamps?